Weddings of Hawaii FAQs - Hawaii Weddings at Their Best! Answers to your questions about Hawaii weddings, elopements, and vow renewals. Fill out a reservation form. Submit a non-refundable deposit (to be deducted from your total cost). Receive your confirmation email with your next steps and more information. We'll begin working on your date and send you a second confirmation email along with an initial invoice within two business days. Can the packages be customized? Absolutely! You are welcome to customize any of the packages to accommodate your requests. What happens after we have reserved our wedding date? Read the important information and follow the link to your "Information Sheet." You'll receive a second confirmation email and invoice within two business days. Apply for a marriage license online (not needed for a vow renewal). Submit your "Information Sheet" around 5 weeks before your ceremony date (or as soon as possible for last-minute ceremonies). Submit final payment 30 days prior to your ceremony. Schedule a check-in appointment with us to go over the details of your day (you'll receive an email around 12 days before your event to help remind you). Pick up your marriage license at the Hawaii State Department of Health upon your arrival. Enjoy your day with the one you love! How do I confirm my wedding date is available? Because we specialize in destination services, we can typically accommodate short notice events. However, if you have a specific date in mind, we highly recommend completing your reservation as soon as possible to ensure availability. Feel free to contact us if you have a tentative date and we can let you know our current availability. Note: We strongly encourage weekday ceremonies if seclusion is important to you. Public beaches are heavily utilized by locals on weekends and holidays. What is the best time of year to come to Hawaii? In our opinion, ANYTIME is an ideal time to have a wedding ceremony in paradise. The average temperature is 75 to 85 degrees, year round. The seasonal change is minimal, yet February and March have a greater possibility of rain. The State of Hawaii requires a permit for all commercial activity at public beaches and parks. The cost is $50.00 per location. We obtain the permit on your behalf. Absolutely! However, it's not a requirement. We typically have a phone meeting with our couples about 1-2 weeks before your ceremony date to talk through all the details. Many couples prefer the phone appointment in order to take advantage of every minute enjoying Hawaii, but we can book an office meeting if you prefer. Either way, we'll make sure you're all set! How many days before our wedding would you recommend arriving in Hawaii? We recommend at least two days prior to your ceremony. This is so you have enough time to get acclimated to the time change, pick up your marriage license, and relax and have a mai tai ;-). Please keep in mind that arriving two days prior is not a requirement. Many couples arrive the day before and even the day of. In these cases, special arrangements will need to be made, and we are happy to accommodate. We're interested in "x" package. Can I add/remove options? Of course! Contact us with your requests and we can provide a quote for you. We recommend choosing the package that's closest to what you want, and you can customize easily from there. It's close, but our Lehua is the winner. It provides what most couples are looking for: ceremony, photos (with a discount on digital images), videos, two hours limo transportation, and flower options. It's the package that covers the basics, and it gives you a lot of room to customize. Our Royal Illima is popular if you know you'd like a second location photo shoot, and our Gardenia is popular for those who just want a nice ceremony and a photographer. Your packages have a lot going on. How do I choose? Kamaaina - You only need an officiant. Gardenia - You only need an officiant and photographer. Maile - You need an officiant, photographer, and limo. Lehua - Video...you want a ceremony and highlight video along with an officiant, photographer, and limo, and some more inclusions, such as flower selections. Royal Illima - You want everything included in the Lehua, and you also want a second-location photoshoot and the choice of in-room hair and makeup or a live Hawaiian musician. Monarch Elite - More of almost everything. We include so much to make your day special that it's best you go to our packages page and read the details. Kalani Illima - Everything we could think of, yet fully customizable. What beach location do you recommend? Sherwood Forest Beach (gallery) is our most popular. Waialae Beach (gallery) is a great option near Waikiki, and it has the palm trees that Sherwood's lacks. Sandy Beach (gallery) is also a great choice for a toes-in-the-sand ceremony. View our popular Oahu wedding locations page. What locations do you recommend near Waikiki? Our two most popular locations near Waikiki are Waialae Beach (gallery) and Magic Island (gallery). Both are a short drive from Waikiki and offer amazing photo opportunities. Waialae Beach has beautiful palm trees, while Magic Islands has amazing views of Diamond Head and Waikiki, along with sunset opportunities. How far is each location from Waikiki? What locations are good for sunset? If you're looking for a sunset wedding, start with Magic Island (gallery). That's our top sunset location, but keep in mind that lighting can be good at many of our locations during "golden hour," so later ceremonies can still be beautiful. One important note: Sherwood Beach does not get a sunset, yet it can be a good choice for a late ceremony if you want to avoid direct sunlight. What is the best day of the week for my ceremony? Weekdays! Holidays and weekends are when the locals take advantage of the beaches, so we always recommend weekdays for seclusion. How long is the wedding/vow renewal? The forecast will show rain! Totally. It rains every day in Hawaii. Will it rain at your ceremony location? Unlikely. But turn and look towards the mountains. You'll often see dark clouds that may or may not produce rain. Will those clouds ever reach you? Not likely, but there are still times of the year we get passing showers at our beach locations. If rain is a real concern, we'll be in touch. What is the Hawaiian Lei Ceremony? The lei ceremony is a time-honored Hawaiian blessing to present fresh flower leis to honor each other as a gesture of love, aloha, and respect. The true meaning of what a lei means is explained during the ceremony which adds a touch of Hawaiian tradition to the event. It is also a perfect way to show your appreciation to your family and friends. The unity sand ceremony is much like a unity candle lighting ceremony. You are each given a small satchel of sand from the beach of which you are married. You then pour the two bags of sand into one, signifying the two of you becoming one. The minister will elaborate in greater detail of the significance during the event. What is the Children's Ceremony? The Children's Ceremony can be included for couples with children attending the ceremony. Shortly after you recite vows with each other, the children will be asked to come forward so you can recite vows with them as well. It's a great way to include the children in the celebration. Can I provide my own vendors? Yes, for the most part, it's fine. Keep in mind that we work as a team. Each member of our team is a piece of the puzzle. Our coordinators are here to plan your day. Our ceremony team is there to execute. If any piece of the puzzle fails, we're all part of that. We all work together to make the most perfect day for you, and that's incredibly important to all of us. When bringing in outside vendors, they are often only concerned with their job, not the team effort, and they are often unfamiliar with the locations. Please keep that in mind. Wedding setups, such as chairs and arbors, are only permitted by Weddings of Hawaii's design team due to liability reasons. A rehearsal is not necessary for a destination wedding. 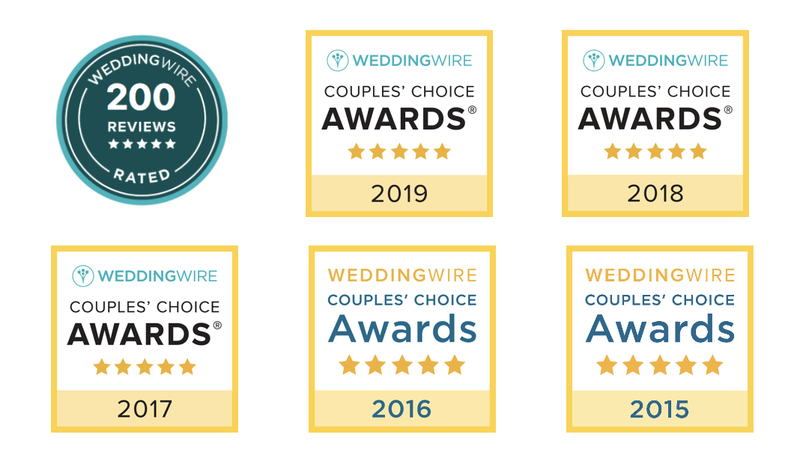 We will go over the details of your service during your pre-wedding consultation, and your officiant and ceremony team will confirm details with you once you arrive at your ceremony location. On-site rehearsals are available for an additional fee (Waikiki locations). Please contact a wedding coordinator for details. Can we have our own officiant? Yes, it is okay if you want to have your own officiant. This is typically a friend or close family member. Please ensure that your officiant is registered as a marriage performer with the State of Hawaii in order to file your paperwork after the wedding. Most often we have a "dual officiant" ceremony. Your officiant to do the vows and ring exchange, while our officiant can perform the Hawaiian elements, pronouncement, and file your marriage license. Just let us know! The great part of a destination ceremony is it allows you to make the rules. There are no requirements on our end. It is not uncommon for the bride to be in a gown and the groom to be in a "Tommy Bahama" style shirt and shorts! Everything works. A little advice on the shoes: high heels on the beach can be a challenge. It's good to wear flats or bring a second pair to walk in. We have an entire blog post about what to wear for your Hawaii wedding to help you consider some options. What are the requirements to legally marry in Hawaii? All that's required is a Hawaii marriage license. The majority of this process is done online; you simply pick up the license upon your arrival. After the event, we will file all legal documentation on your behalf. Typically, the only documentation required to obtain the license is a photo ID, such as a driver's license or passport. There are no citizenship or residency requirements; your marriage is legal throughout the world. Some countries do require an Apostille, and you can apply for this document when obtaining the license. Your wedding confirmation will provide all necessary information to obtain the license. You can apply and obtain a marriage license the same day. You can pre-apply for the license within one year of the wedding date. Once the license is physically obtained, it is good for 30 days. The State of Hawaii will issue a temporary copy of the marriage license which can be downloaded online within a few days of the ceremony. You will then receive a certified copy of your marriage license by mail within 120 days of your wedding. If you need a certified hard copy of your marriage license sooner, you can go online to request the copy or contact the Department of Health (808-586-4544) for more information. No, the State of Hawaii does not require a witness. How long does it take to get my photographs and videos? Our photographers and videographers do their best to get your images and video to you as soon as possible. Both are typically available within two weeks (often sooner). Once they are available, you will receive an email link to download the video and access your online image gallery. Why do you recommend your photographers and videographers? We only work with the best! We trust our team, and we know they work well together. They know the locations, they're familiar with our style, and they care. We all know how important the day is, and we only work with those who want to make this one of the best days ever! If you like what you see on our website, great! That's a good example of what you'll receive. Can we give requests for poses? Absolutely! Our photographers will ask if you have any requests, and please do let them know! They know how to capture the day, and they'll do their best to get a huge variety for you. However, they appreciate you communicating with them. Let them know if you have specific shots in mind. They want you to be happy, after all! You may also like our post on Posing Tips for your Wedding Photos & Videos. What do most of your couples do for a reception? For destination weddings and vow renewals, celebrations can come in many different styles. For most couples, a nice dinner at a Waikiki restaurant is the perfect way to celebrate. We have a list of our favorite recommendations on our Hawaii Receptions page. Remember, destination weddings are non-traditional by nature, so how you celebrate is up to you! Do you have recommendations for our after-ceremony celebrations? Yes, please check out our Wedding Receptions page for more details. What's an affordable, easy option to celebrate with our guests? There are a lot of choices, and many of our couples and their guests enjoy Tiki's Grill. Do you recommend a luau to celebrate our special day? Yes, or if not for your special day, then perhaps another evening while you're in Hawaii. A luau is a great way to experience the Polynesian-Hawaiian culture. Our two favorites are Ka Moana Luau and Diamond Head Luau. We're happy to make a booking on your behalf. We can secure your reservation and defer payment until 30 days prior to your event. Email coordinator@wedhawaii.com for more details or booking. Is there a limit on the number of guests we can bring? We would never limit the number of guests you invite to your special day. We do, however, need to know how many people are attending to obtain the appropriate permit. For couples with over 50 guests, please contact your wedding coordinator to discuss your options. How can guests get to the ceremony? Your guests have several options when planning transportation to your ceremony. If you'd like to provide transportation for them, we offer additional limousine and bus options. Please email coordinator@wedhawaii.com for more information. For Magic Island and Waialae Beach, both locations are within an affordable Uber/Lyft or taxi ride, and many guests decide to drive themselves. If your guests have rental cars, carpooling is a great option, but please remind your guests to be early. If your guests are late and it delays the ceremony, that will cut into your photo and video time. What are the most important things we should tell our guests? We wrote a blog on 10 Questions from Your Guests, which a great read if you have family and friends attending your ceremony. Let them know their transportation options to help them plan. Forward your guests the directions email we send you. When is the best time of year to travel to Hawaii? Hawaii is beautiful year-round! In our opinion, there's never a bad time to travel to Hawaii. Can you give us some travel tips? Certainly! We have a blog post about Planning Your Travel to Hawaii, and we're happy to answer any questions you have. We also have a fun blog Things to Do on Oahu.